Frontline launches its new season tonight .. with a feature titled » Obama's War. We're taken to Afghanistan, where we hear a commander begin the segment by saying, "We are experts in the application of violence." Catchy. Got my attention. Was surprised to hear the f-word uttered so many times. Soldiers use the f-word a lot. Even more than sailors do. But then, sailors don't normally get shot at .. which can't be a very pleasant experience. Great contrast showing the difference between the suit-n-tie crowd discussing policy in an air-conditioned banquet-room in Washington .. with soldiers dodging bullets in Afghanistan's withering heat (.. one of whom got shot thru the neck and died). If nothing else, this program illustrates the gulf that exists between the Washington policy-makers and the bullet-dodging soldier. I'm convinced that anybody who is involved in making war policy should be required spend a week (just a week) with the soldiers who are charged with executing policy. Nothing like a little first-hand experience to inject a dose of reality into the plan. Cuz it's much easier to make policy, while sitting in an air-conditioned room (sipping a dry martini) .. than it is to execute policy .. with bullets whizzing by your head. Continue reading Frontline Launches New Season with » Obama's War. Today is Martin Luther King day. I find it interesting (and coincidental) that the very next day we swear-in our first black president. What are the odds these two (seemingly unrelated) days/events would occur consecutively? I also got the highest grade in my Statistics class (taken the same semester as Calculus). The professor who taught my 'Stats' class taught two classes that semester. He told me I got the highest grade in *both* classes. Depending on how you categorize the variables, the odds of these two days/events occurring consecutively..
.. would be between 1-in-365 (the number of days in a year) and 1-in-133,225 (which = 365x365, since each event could theoretically fall on any given day). I could spend today's entire entry discussing the nuances associated with probability & statistics, but my point is » the odds are miniscule .. no matter how you dice the math. My brain, for some reason, seems predisposed to identify the statistical curios associated with seemingly unrelated events ('coincidences'). It's not something I try to do, mind you. Just seems to occur on its own. We know that the inauguration date would've been the same whether Obama or McCain was elected. And (we know that) MLK could've been born on any day. Moreover, his birth (which we celebrate with today's holiday) obviously had nothing to do with our presidential inauguration. I'm not drawing any conclusions .. merely identifying a curious coincidence. And it's obvious the work MLK did back in the 60's preceded Obama's rise to the presidency (chronologically). So even the ordering of the consecutive days aligns correctly with historical events. 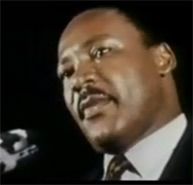 Continue reading Martin Luther King Day (Coincidentally) Precedes Obama's Inauguration. Went to Tom's last night for a house-warming party. He recently sold his townhome and moved into an apartment. I said, "Dude, turn on the elections." He hadn't yet set up his cable TV service, so he dug out an old set of rabbit ears from a storage box, and spent 20 minutes trying to get a signal. We watched the election returns on his (new) plasma TV .. connected to a (old) set of rabbit ears. The signal periodically faded, then returned. Interesting how we watched history being made via the old (rabbit ears) and new (plasma TV). Kinda symbolic. Everybody was wiping tears. (Tho for different reasons.) Some felt history books a hundred years from now will point back to this night as a major milestone (.. for better or worse, which remains to be seen). 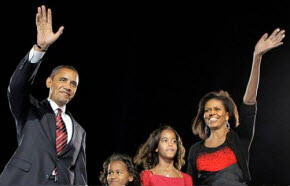 Continue reading Barack Obama Elected First (half) Black President.